hall, along with drift sand and pot sherds. Over 2.5m of fill was removed from a 10 x 15m square to expose the remains of six columns and a large part of the southern half of the first court, which as expected, was the mirror image of the northern half. The first court is a substantial room with its interior measuring 10.8m east-west by 27m north-south. A doorway (1.58m wide), leading to the temple exterior, was located in the south-east corner of the room and again a similarly situated entrance was located in the northern half of the court. The columns were distributed in two rows. The drums were constructed of red-brick quarter-circles mortared together with mud and then plastered on the exterior with mud and lime plaster to form columns 1.25m in diameter that rested on square foundations. This technique was used elsewhere in the temple; however, the columns in the first court are by far the largest. The various stages in the collapse of the building were clearly visible in the baulk which ran parallel to the east face of the southern entrance pylon (Plate 2). The two southern columns (H770, 773) had collapsed one on top of the other (Plate 3), likely due to instability resulting from the collapse of the roof and the subsequent infiltration of rainwater following the structure’s abandonment. This collapse is sizeable measuring over 3.5m long and ranging in width from 1 to 2.5m. The upper part of the central column in the western row (H761) had slipped and rotated roughly half a metre eastwards during its collapse, yet this upper section remained intact and stood upright with much of its plaster still preserved (Plate 4). At the end of the season, excavation stopped just above the floor surface and the southern entrance pylon remained unexposed. The fill above the floor consisted of debris attesting to the temple’s destruction by fire and included charcoal, ash and charred dom palm roof beams. Julie Anderson and Salah eldin Mohamed Ahmed The 2010 field season of the National Corporation for Antiquities and Museums, Sudan, at Dangeil ran from mid October until the beginning of December.1 Dangeil is a Kushite site situated south of the Fifth Cataract, just north of the city of Berber. This season excavations were conducted in two areas, the first being in the 1st century AD Amun temple, a building which dominates the site and is situated in the centre of a large temenos enclosure, and the second in the associated Kushite cemetery, designated WTC, which dates between the 1st century BC and 1st century AD (Plate 1). Plate 1. Google Earth image with the sites of Dangeil and the associated WTC cemetery encircled. Excavations within the Amun temple concentrated on clearing the remaining unexcavated portion of the temple in the south-west part of the building (Figure 1). The objective was to complete the plan of the complex by uncovering the southern half of the temple’s main pylon entrance and the remainder of the first court. 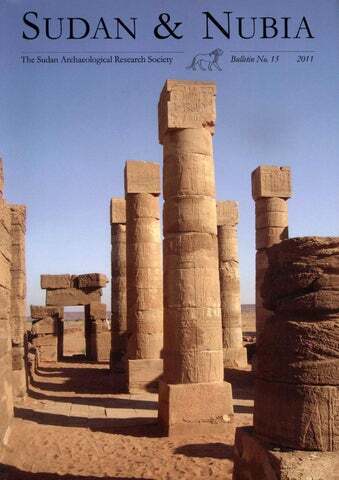 The fill of this area was extremely dense and consisted of lime plaster, mud-brick and red-brick rubble which originated from the collapse of the southern half of the pylon and from the columns within the 1 The team consisted of Julie Anderson, Salah eldin Mohamed Ahmed, Aurore Ciavatti, Maha Abbas Mohamed, Mahmoud Suliman, Julian Reade, Rihab Khider, Adam Giambrone, Nasreen Abdel Hadi, Suzan Benjamin, Marcel Metry, and Yassin Mohamed Saeed. The mission is grateful to The British Museum, Archeology4All, Fundacja Ochrony Zabyzków, N. Oppenheim, and an anonymous donor for their support. Plate 2. Southern half of the first court of the Amun temple at the end of excavation. Figure 1. Plan of the Amun temple, Dangeil. Scale 1:1000. Areas of 2010 work shown in red. Plate 4. Rotated column H761. Plate 5. Burnt column base. Plate 8. Abacus (?) face bearing an ankh. Plate 6. Charred palm roof beam in situ. Plate 9. Ceramic baboon head (5/10). Plate 7. Abacus (?) face with Meroitic hieroglyphs. Plate 10. South wall of the tomb chapel of Queen Shanakadakhete (EA 719, ÂŠ The British Museum). The tomb owner, rather than a god or goddess, is shown as the recipient of the offering procession and adoration; however, the degree to which Kushite rulers themselves may have been viewed as gods remains unclear. was drawn on the column prior to the drawing of the figure. Similarly, fecundity gods were carved on the lower registers of the sandstone columns and painted on the lower registers of the walls in the sanctuary. These figures embody the Nile ensuring water, life and fertility. The neighbouring column H761 (Plate 13) was displaced from its original position. It is remarkable that in spite of this displacement, the plaster and upper courses of bricks remained intact. The painting is of a striding figure, wearing a kilt and bearing a staff in the left hand. The skin is blue, while the kilt and staff are yellow with the details highlighted in red. The figure was also initially outlined in red. It is possible that this is the god Amun; however, as the head is missing it is difficult to be certain. This figure is larger in size than the fecundity figure on the other column (H762) although the painting technique used is the same. It is probable that the upper registers on the columns depicted various gods such as Amun, possibly receiving offerings or adulations from the Kushite rulers. Plate 11. Fecundity god on lower register of column H762. Plate 12. Close-up of painting of the fecundity god on column H762. Plate 13. Painting of god (Amun?) on upper register of column H761. leading figure. The background is light blue. The left side of the painting is also unclear and may also represent part of a building or some sort of table of offerings. Unfortunately, the longer one looks at these fragments, the more creative the interpretations become. Plate 15. Structure (?) towards which the smaller figures are striding. Plate 17. Kushite tombs in WTC 5, facing west. chambers were sealed with mud bricks or red bricks or a combination thereof (Plate 18). Grave goods recovered included numerous large beer jars (Plate 19), which were usually placed at the tomb entrance just inside the blockage wall, several small, wheel-made red-ware bowls, a painted fine-ware cup from WTC 5, tomb F (Plate 20), beads, and a faience vase which was found nestled up against a beer jar in WTC 8, tomb 1 (Plate 21). A glass flask was found among the poorly preserved skeletal remains in WTC 5, tomb M (Plates 22 and 23). This tomb also contained a small copper-alloy jar (Plate 24). Many of the human remains and organic material from the cemetery were in poor condition due to the presence of salt and water seepage, factors which are exacerbated when tombs have been robbed and disturbed. Plate 16. Three small figures with red legs striding westward. The priest is the central figure with the tail of his garment indicated by the blue arrow. Plate 18. Brick blocking of the tomb chamber. Plate 21. Faience vase from WTC 8, tomb 1. Plate 20. Fineware cup from WTC 5, tomb F.
Plate 22. Glass flask among the skeletal remains in WTC 5, tomb M.
Plate 23. Close-up of glass flask from WTC 5, tomb M.
ference between ancient and modern material. The additions are removable, wear well and are locally sourced. Similarly, the application of lime mortar consolidated the ancient bricks in the stairwell of the northern half of the main entrance pylon successfully (Plate 26). Lime rendering applied as a sealant to a column did not work, but subsequent chemical analyses of the various local supposed lime products led to the discovery that some contained no lime whatsoever, and thus the lime rendering initially used on the column actually contained no lime. This problem has since been addressed. Plate 26. Conservation and consolidation of the staircase in the northern half of the entrance pylon. The greatest challenge faced is the conservation of the temple walls. These walls have red-brick foundations, are faced on the exterior with fired red brick, and have mudbrick cores. The penetration of rain water into the mud-brick masonry leads to the explosion and subsequent collapse of these walls; thus leaving the walls in their original state of discovery would lead to the rapid deterioration of the building. There is an ongoing loss of original material due to environmental and human factors.5 Various trials using locally sourced material to create a water-proof, protective and sacrificial capping for these walls have been conducted and are ongoing. Currently, the red-brick wall exteriors are reconstituted using modern bricks and lime mortar up to the level of the preserved ancient mud-brick core, then the top of the wall is capped with fired bricks (Plates 27 and 28). 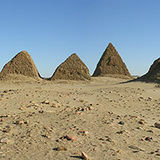 The technique of capping A lengthy discussion of the preservation and restoration of Sudanese monuments and the causes of deterioration and suggested protective measures may be found in Hinkel 1992. Sudan & Nubia Boundaries: Contributions to the Munich Congress 28 August – 1 September 2006. London, 333-334. Hinkel, F. 1992. ‘Preservation and Restoration of Monuments Causes of Deterioration and Measures for Protection’, in C. Bonnet (ed.). Études Nubiennes. Vol. 1. Geneva, 147-185. Pyke, G. 2007. ‘The Fragmentary Wall Plaster’, in P. J. Rose. The Meroitic Temple Complex at Qasr Ibrim. London, 44-68. Shinnie, P. and R. Bradley 1981. ‘The Murals from the Augustus Temple, Meroe’, in. W. K. Simpson and W. M. Davis (eds). Studies in Ancient Egypt, the Aegean, and the Sudan. Boston, 167-172. Sweek, T., J. Anderson and S. Tanimoto in press. ‘Conservation of an Amun Temple in Sudan’, Proceedings of the 2nd Historic Mortars Conference. Repair Mortars for Historic Masonry. Prague. 8pp. Sweek, T., J. Anderson, S. Tanimoto, Salah eldin Mohamed Ahmed in press. ‘Conservation of an Amun Temple in the Sudan’, Proceedings of the 12th International Conference for Nubian Studies. London 1-6 August, 2010. London. 5pp. Wildung, D. 2011. ‘Götter und Herrscher’, in K. Kröper, S. Schoske and D. Wildung (eds). Königsstadt Naga. Munich, Berlin, 22-51. Plate 29. Southern half of the gate into the sanctuary area after initial conservation. Agnew, N., M. Taylor, A. Alva Balderrama and H. Houben (eds) 1990. 6th International Conference on the Conservation of Earthen Architecture: Adobe 90 preprints: Las Cruces, New Mexico, U.S.A., October 1419, 1990. Los Angeles. Avrami, E., R. Mason and M. de la Torre (eds) 2000. Values and Heritage Conservation. Research Report. The Getty Conservation Institute, Los Angeles. Los Angeles. Bradley, R. 1981. ‘Wall Paintings from Meroe Townsite’, Meroitica 7, 421-423. Bradley, R. 2003. ‘Painted Plaster Murals from Meroe Townsite’, Sudan & Nubia 7, 66-70. Brown, R., B. Sandoval and M. Haydee Orea. 1990. ‘The Protection and Conservation of the Adobe Structures at Paquimé, Casas Grandes, Chihuahua, Mexico’, in Agnew et al., 204-207. Caperton, T. 1990. ‘Fort Selden Ruins Conservation’, in Agnew et al., 209-211. English Heritage 2001. English Heritage Policy Statement on Restoration, Reconstruction, and Speculative Recreation of Archaeological Sites including Ruins. http://www.helm.org.uk/upload/pdf/Restoration%2C_ Reconstruction%2C_and_Speculative_Recreation_of_Archaeological_Sites_including_ruins_%282001%29.pdf ?1305783417 Downloaded January 6, 2011. English Heritage 2008a. Conservation Principles Policies and Guidance. http://www.english-heritage.org.uk/publications/conservationprinciples-sustainable-management-historic-environment/ Downloaded January 6, 2011. English Heritage 2008b. Constructive Conservation. http://www.english-heritage.org.uk/professional/advice/conservation-principles/constructive conservation/ Downloaded January 6, 2011. Hesse, A. 2006. ‘Wall Painting Fragments from the Amun Temple in the Ancient City of Naga in Sudan’, in D. Saunders, J. Townsend and S. Woodcock (eds). The Object in Context: Crossing Conservation 10 ‘The best way to save a building is to find a new use for it. Even recently restored buildings that are vacant will soon start to degenerate again. An unreasonable inflexible approach will prevent action that could have given a building new life’ (English Heritage 2008b, 1).